Here's a collection of Kitty Humor. If you come across something that made you laugh, please email it to us so we can share it with all of our readers. ©2001 Mark Mason. All Rights Reserved. On the twelfth day of Catmas my humans gave to me ... Twelve human hugs and kisses. It makes up for all the rest. Go to closet and collect bag in which present is contained, and close door. Open door and remove cat from closet. Throw away first sheet as cat chased the scissors, and tore the paper. Cut second sheet of paper to size - by putting cat in the bag the present came in. Lift up edges of paper to seal in present. Wonder why edges don't reach. Realize cat is between present and paper. Remove cat and retry. lace object on paper, to hold in place, while cutting transparent sticky tape. Spend 20 minutes carefully trying to remove transparent sticky tape from cat with pair of nail scissors. Look for roll of ribbon. Chase cat down hall in order to retrieve ribbon. Re-roll ribbon and remove paper, which is now torn due to cat's enthusiastic ribbon chase. Decide to skip steps 13-17, in order to save time and reduce risk of losing last sheet of paper. Retrieve old cardboard box, that is the right size for sheet of paper. Once inside lockable room, lock door and start to re-lay out packing materials. Discover cat has already torn paper. Unlock door go out and hunt through various cupboards, looking for sheet of last year's paper. Remember that you haven't got any left because cat helped with wrapping last year. Seal box, wrap with paper and repair by very carefully sealing tears with transparent sticky tape. Tie up with ribbon and decorate with bows to hide worst areas. Spend 15 minutes looking for cat, before coming to obvious conclusion. Retrieve all discarded sheets of wrapping paper. Feed cat. Return to lockable room for last attempt, making certain you are alone and the door is locked. Find least torn and wrinkled sheets of paper. Attempt to use sheets of same pattern. Vainly try and wrap present in patchwork of paper. Tie with now tattered ribbon and decorate with the now limp bows. Label and put present in bag, for fear of anyone seeing this disaster. When giving the gift, smile sweetly at receiver's face, as they try and hide their contempt at being handed such a badly wrapped present. Swear to yourself that next year, you will get the store to wrap the damn thing for you. Smile smugly, knowing that the recipient could have received a cat! A local business was looking for office help, so they put a sign in their window saying "HELP WANTED. Must be able to type, must be good with a computer and must be bilingual. We are an Equal Opportunity Employer. A short time afterward, a dog trotted up to the window, saw the sign and went inside. He looked at the receptionist and wagged his tail, then walked over to the sign, looked at it and whined. Getting the idea, the receptionist got the office manager. The office manager looked at the dog and was surprised, to say the least. However, the dog looked determined, so he led him into the office. Inside, the dog jumped up on the chair and stared at the manager. The manager said, "I can't hire you. The sign says you have to be able to type." The dog jumped down, went to the typewriter and proceeded to type out a perfect letter. He took out the page and trotted over to the manager and gave it to him, then jumped back on the chair. The manager was stunned, but he told the dog, "The sign also says you have to be good with a computer." The dog jumped down again and went to the computer. The dog proceeded to demonstrate his expertise with various programs, producing a sample spreadsheet and database and presenting them to the manager. By this time the manager was totally dumbfounded. He looked at the dog and said, "I realize that you are a very intelligent dog and have some interesting abilities. However, I *still* can't give you the job." The dog jumped down and went to a copy of the sign and put his paw on the part about being an Equal Opportunity Employer. The manager said, "Yes, but the sign *also* says that you have to be bilingual." The dog looked him straight in the eye and said, "Meow." Heat flows from a warmer to a cooler body, except in the case of a cat, all heat flows to the cat. A cat can make her body long enough to reach just about any countertop that has anything remotely interesting on it. A cat will accelerate at a constant speed, until he gets good and ready to stop. A cat's resistance varies in inverse proportion to a human's desire for her to do something. Although a cat can hear a can of tuna being opened a mile away, she can't hear a simple command three feet away. All cats in a given room will locate at points equidistant from each other, and equidistant from the center of the room. It is not possible to predict where a cat actually is, only the probability of where she "might" be. Go ahead! Sing along in the same tune as for the 12 Days of Christmas. On the First Day of Christmas my 'true love' gave to me. On the Second Day of Christmas, my 'true love' gave to me. On the Third Day of Christmas, my 'true love' gave to me. On the Forth Day of Christmas, my 'true love' gave to me. On the Fifth Day of Christmas, my 'true love' gave to me. On the Sixth Day of Christmas, my 'true love' gave to me. On the Seventh Day of Christmas, my 'true love' gave to me. On the Eight Day of Christmas, my 'true love' gave to me. On the Ninth Day of Christmas, my 'true love' gave to me. On the Tenth Day of Christmas, my 'true love' gave to me. On the Eleventh Day of Christmas, my 'true love' gave to me. On the Twelfth Day of Christmas, my 'true love' gave to me. Thou shalt not jump onto the keyboard when thy human is on the computer. Thou shalt not unroll all of the toilet paper off the roll.Thou shalt not sit in front of the television or monitor as thou are not transparent. 6:00 am. I am going to bed. (work nights). Cat is snoring at end of bed. 6:15 am. I make a bathroom trip. Cat is still snoring. 6:30 am. I let out other cat. Cat is still snoring. 6:45 am. I am asleep. Cat is waking up. 6:48 am. Cat is on my pillow, staring at me. 6:49 am. Cat stare has drilled hole in my head. I wake up, but feign unconsciousness. 6:50 am. Cat is onto me. He knows a faker. Cat meows VERY softly. I ignore cat. 6:51 am. Cat meows more loudly. I ignore cat. ruptures. I tell cat to go wake up husband. intently. Husband has no cat radar, therefore continues to sleep. 6:54 am. Cat sits on husband's chest. Husband continues sleeping. 6:55 am. Cat leans forward and meows softly. Husband sleeps on. 6:56 am. Cat meows more loudly. He is ignored. 6:57 am. Cat stands on husbands face. Husband, fearing suffocation, wakes up. 6:58 am. husband stupidly asks, "what do you want, cat?" Cat proceeds to yank mini blinds off wall and point outside. We cats are beautiful, sophisticated, intelligent creatures. With a little love and caring, we can keep a human being alive for upwards of seventy to eighty years. If you follow these simple instructions, you can have your human marginally trained in no time. CLEANLINESS: For some reason, humans seem to enjoy immersing themselves in running water. Attempts to get humans to lick themselves clean can prove interesting. Start by licking them on their lips to stimulate their salivary glands, as they will need plenty of saliva for their enormous bodies. If they pull away, do not be discouraged. Lick your bottom to give them an example, and begin again. If attempts fail, try negative reinforcement by joining them in their showers thwarting their attempts to cleanse themselves, or scratching at the shower door and meowing loudly, if necessary. After they emerge from the shower fully alert, give them a demonstration of a lick bath, licking the water off of them, and then licking yourself. COMMUNICATION: Humans are unable to speak a proper language. Therefore, you will have to work hard to get them to respond to commands. Communicate a point loudly, repeatedly, and if at all possible, at about three in the morning. In the hardest cases, surprise is the preferred method of human training, as it appeals to what little instincts humans have, so is most likely to illicit a response. You will know you are making progress when they respond with pets and treats. Any attempts at human-to-cat communication can be dealt with by simply ignoring it until it stops. In extreme cases, a show of claws may be necessary to stop their behavior. FEEDING: Morning feeding should start promptly when your human is fast asleep, preferably three or four minutes before the alarm is supposed to go off. Recommended methods of waking your human include: sitting on their face, screaming in their ear, and biting their hair. When they wake up, remember to positively reinforce the behavior by purring and looking happy. HUMAN ROMANCE: When humans are courting, their behavior is fascinating. Unfortunately, humans tend to get easily spooked by prolonged study of them while they're in heat and sometimes resort to throwing slippers. We may dream of the day when we can have them spayed and neutered, but for now, the best advice is to leave the room, or fall asleep under the bed. 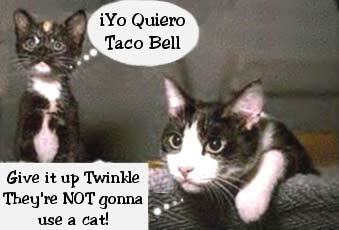 TOILET TRAINING: A human's natural tendency is to not change your litter box. Although experts in human behavior believe it can be attributed to the "procrastination reflex," this can be easily corrected through what is called "shoe therapy." Remember that a human shoe looks a lot like a human toilet, (just your size), and you should be fine. Always couple this negative reinforcement with a lot of love, and be prepared to give your human a time-out. Following these simple tips is the first step towards a long and productive cat/human relationship. Good luck with your human! DAY 761 - Today my attempt to kill my captors by weaving around their feet while they were walking almost succeeded, must try this at the top of the stairs. In an attempt to disgust and repulse these vile oppressors, I once again induced myself to vomit on their favorite chair...must try this on their bed. DAY 774 - I am convinced the other captives are flunkies and maybe snitches. The dog is routinely released and seems more than happy to return. He is obviously a half-wit. The Bird on the other hand has got to be an informant. He has mastered their frightful tongue (something akin to mole speak) and speaks with them regularly. I am certain he reports my every move. Due to his current placement in the metal room his safety is assured. But I can wait. It is only a matter of time. In the Bronx, NY, lived a rich cat who was a bit of a snob, though she did begin to chat on occasion with her neighbor, an alley cat. One day, she announced that she was about to have an operation, but she didn't mention what it was for. Two weeks later, her humble friend saw her again and inquired politely how she was feeling, then dared to ask what kind of operation she had had. "Oh, I am quite well now, thank you," the rich cat replied, stiffly. "I had a hysterectomy." "For heaven's sake!" the alley cat exclaimed in exasperation, "Why can't you call a spayed a spayed." Symptoms: The affected cat places one side of its head on the ground as though cheek-marking the concrete, carpet etc. After several such maneuvers, the legs on that side of the cat suddenly collapse, leaving the cat waggling its feet in the air. Treatment: This involves placing the palm of one hand on the exposed belly and rubbing gently. There are side-effects though - some feline sufferers attack the rubbing hand while others recover spontaneously, often after prolonged treatment. This condition is probably incurable and any cat which requires prolonged treatment after an attack will most likely suffer repeated attacks of collapsible legs throughout its lifetime. Symptoms: The affected cat repeatedly head butts any available part of a readily available human and turns its head slightly so that the lips and cheek are rubbed against legs, arms, clothing etc. This condition gets its name from a contraction of the phrase "soggy nudging." Snudging may well be a form of excessive scent-marking. A bad attack can result in soggy clothing. Symptoms: The cat appears unable to settle comfortably on laps, instead treading, kneading, rearranging itself, fidgeting, vocalizing, getting up and turning around, falling off lap and getting back on again, attacking magazines, needlework, computer keyboard, telephone etc. Treatment: Topical treatment with proprietary anti-fungals is ineffective. Prompt treatment (as per Irritable Lap Syndrome) is required to alleviate the worst symptoms although in a number of cats, such treatment actually exasperates the condition. This disorder manifests itself periodically through the affected cat's life and there is no long-term cure. Symptoms: Varied: sucking at clothing, owners earlobes/nose/fingers/skin, drooling, glazed expression. Often accompanied by kneading and high volume purring. Are You a Cat Addict??????? Do you, or have you ever owned a cat(s)? Have you felt like you are the pet? Do you spend more time playing/cuddling with your cat(s) than reading a book or watching TV? Does your cat(s) eat better than you? Does your cat(s) furniture look nicer than the people furniture? Do you spend more on the cat toys and food than you do on treats for yourself? Are your cat(s) considered family members with complete voting rights? Do you move over at night so the cat(s) have more room in bed? Have you bought/considered buying a bigger bed so the cat(s) have more room? Are nose prints on windows a permanent fixture? Do you/have you ever gotten down on all fours and batted a cat toy to entice your cat(s) to play? Do you mimic the meows and purrs of a cat? Can you purr while inhaling and exhaling? Do you refer to yourself/spouse/partner as Mommy/Meowmie or Daddy? Do you refer to your cat(s) as "furbaby" or "furkid"? Have you ever moved for the comfort of your cat(s)? 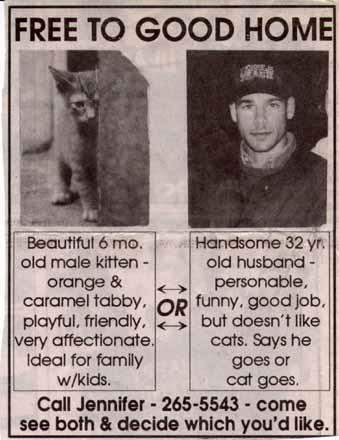 Have you chosen a spouse/partner based on your cat(s) recommendation? Have you ever just watched a sleeping cat(s)? Have you ever gone to the store to buy a necessary item such as TP, shampoo, etc., only to find yourself driving away with cat toys, having completely forgotten why you went in the first place? Have you ever changed your sleeping habits or positions for the comfort of your cat(s)? Have you ever found yourself sleeping in the exact same position as your cat(s)? Have you ever rearranged the furniture so that your cat(s) have better access to windows? Does your collection of cat-related books, magazines, or videos take up an entire bookshelf/case? Is the cat theme a primary decorating technique? Have you ever caught yourself bird-watching with your cat(s)? Is cat hair a major food group? Have you ever opened a can of cat food and thought "that smells kinda good"? Do you feel guilty if you go out to eat and not bring back something for your cat(s)? Do you spend more on your cat(s) than on yourself? 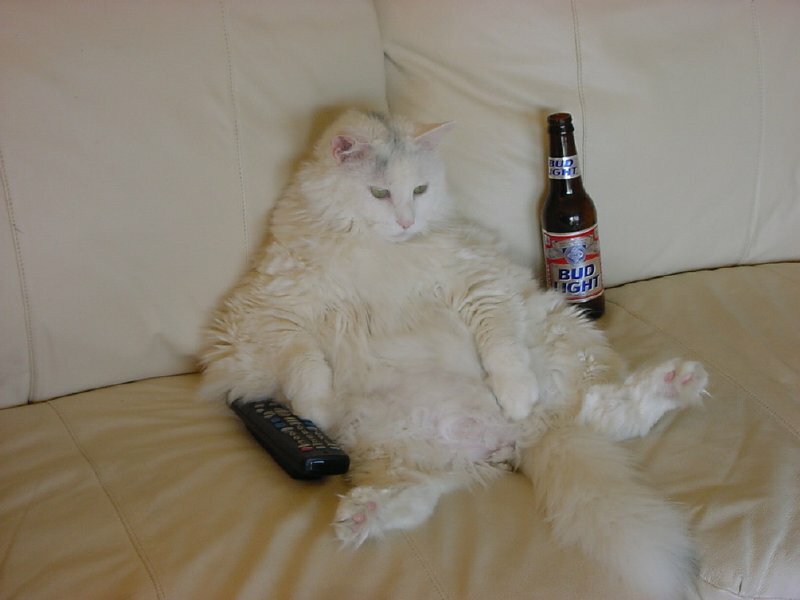 Have you turned the TV to an animal show so your cats can watch? Do you spend more time on cat-related chat boards and pages than anywhere else? Do you read snippets of cat magazines or books to your cat(s)? Are cats the most fascinating creatures on earth? Add up all your YES answers to get your cat-itis score! 8 or less: You have caught the bug, but are still relatively sane. Just give it time. 9-16: You have a mild case of cat-itis. Seek no medical treatment; there is no cure. Now is the time to begin playing with cat toys and seeking new toys around the house. Work on that meow, the tone is slightly off. 17-26: Your condition is severe. Cats have a firm hold on your life. This is the point where anything cat is more interesting than people. Your purr may still need work though. 27+: You are now an honorary cat, you may groom yourself when and where you please. You have the purr and meow down pat. It is not unusual to find yourself thinking as a cat.